We have officially lived in our house for a year now! Time has really flown by. I think of it like we just barely moved in. Slowly (very slowly) we have been fixing things up and getting the house to live up to it's potential. It is definitely an ongoing process. 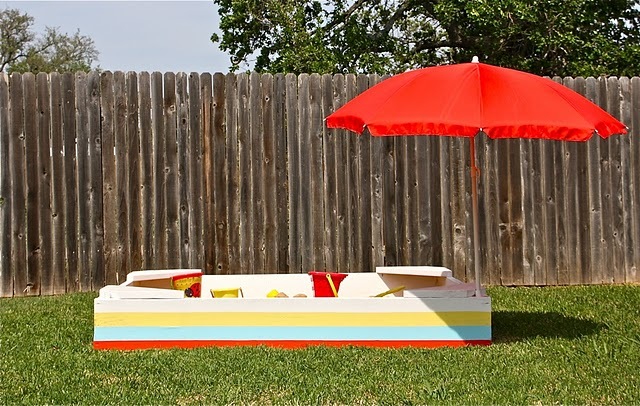 One of the things that I can't stop thinking about is fixing up our backyard. Right now, we have no fence, poison ivy, a bunch of pine trees, and a bunch of pine needles instead of grass. It's not exactly the perfect place to play (did I mention the killer dog next door that likes to run in our yard whenever he pleases? ), so I have been dreaming up ways that we can fix it up. Most of the things we really need (fence, trees cut down) will have to wait until we can save up for them, but I'm sure there are some little things we can do until then. We have a great little slide/play set castle that Ande loves to play on (Thanks mom&dad!) and a couple cheap patio chairs would be perfect for lounging while he plays. 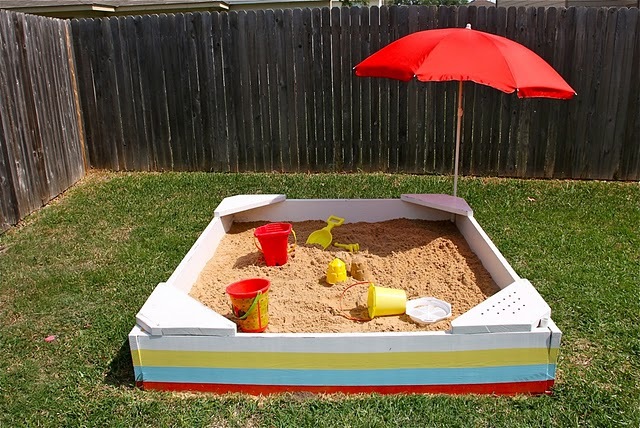 Then, I saw this amazing backyard sandbox tutorial﻿ on the blog, MADE. I mean seriously. This thing is ADORABLE! What is not to love about it? Oh, I just can't wait until we get rid of some big ol' pine trees, actually have sun and grass, and I can make Curtis build me one of these. We would never need to leave the house again! Anyways, make sure you visit Made for the lovely tutorial that she put together and then go have yourself a wonderful long Memorial Day weekend! I CAN'T WAIT to hit up the pool, how about you?